The Marlins ended the first half of the season on a high note, winning the series in San Francisco. Not only was it a series win but a sweep, their first this season. The first game we saw a terrific start from Dan Straily as the Marlins jumped all over the Giants early, striking 5 runs in 2 innings. Straily pitched an awesome game going an unheard of 8+ innings, giving up a mere solo homerun to improve to 7-4. In the first inning alone Giancarlo hit number 24 scoring Dee Gordon while J.T. Riddle laced a 2-run single to help the team jump ahead 4-0. 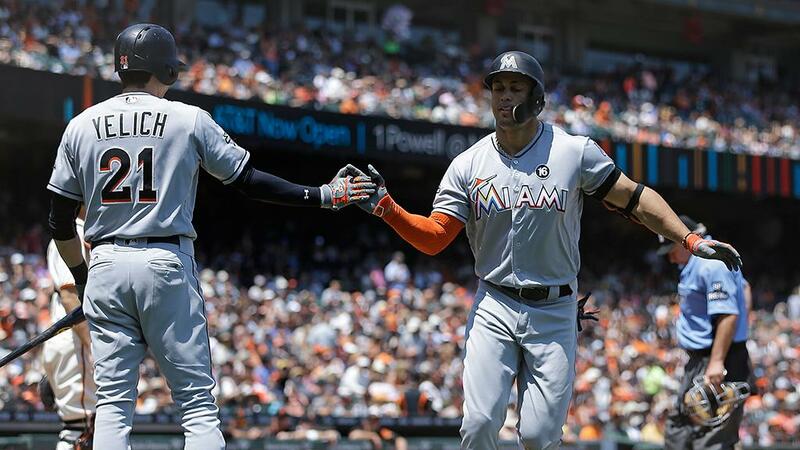 Justin Bour got into the act with a single of his own in the second inning, bringing Dee home to score with the other J.T (Realmuto) going yard in the fifth as the Marlins rolled San Fran 6-1 on an excellent start to the series. The good times kept on going as rookie Chris O’Grady took to the mound in his Major League debut. 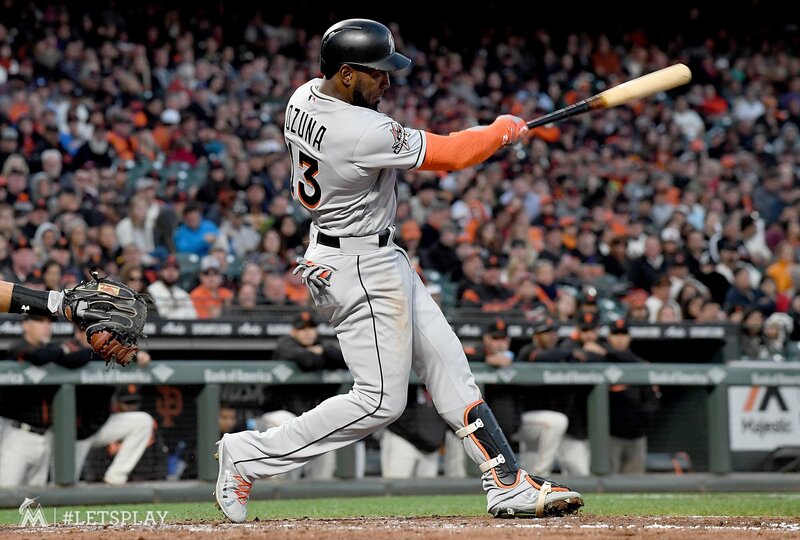 Christian Yelich and Marcell Ozuna contributed to a quick 2-0 lead after the first with Bour smacking his twentieth homer of the season to give the kid some cushion. Ozuna singled again in the fifth to put the fish up 4-1. However, the Giants would not go quietly, scoring 2 runs at the bottom of the sixth thanks to Brandon Belt and Brandon Crawford keeping the game close at 4-3. O’Grady would make it until the sixth giving up 3 runs on 5 hits while fanning 4. With the score 5-3 A.J. Ramos went in for the save. He wobbled a bit too much, walking Brandon Crawford only to strike out Miguel Gomez and then give up a single to Conor Gillaspie, putting runners at the corners. He got Denard Span swinging but gave up a hit to Joe Panik. A guy who hasn’t hit alllll game! Now with the tying run at third and Hunter Pence at the plate, I got really nervous. Thankfully Ramos got out of his funk and struck out Pence, affording the youngster his first victory. Welcome to the big leagues O’Grady! The series finale was an all-out 11 inning shootout as it was the Giants who scored first with a 2-run homer from Brandon Crawford. A pair of doubles from Yelich and Ozuna in the third tied the game with Stanton homering twice, both times to help the Marlins retake the lead in a rather back and forth battle. Bour, Realmuto and Riddle hit their way into a 4 run bash in the seventh…only for Kyle Barraclough to cough up 3 runs, blowing a 7-4 lead in the eighth ultimately sending this baby into extras. Then beautiful homers from A.J. Ellis and Stanton in the eleventh hour (inning really) sealed it for the Marlins to win 10-8 giving them their first series sweep this season. 18 runs and 27 hits in this one, the fans sure as heck got their money’s worth. Ureña lasted 5 frames giving up 3 runs, two of them homers, with Wittgren getting the win and Ramos the save. Giancarlo Stanton had a beautiful performance hitting not 1, not 2 but 3 monster dongs in the series collecting 4 RBIs and 6 runs. Justin Bour for his part hit a dinger, the twentieth of the season, along with a double, his twelfth, during the visit to San Francisco amassing 5 hits in total and 4 RBIs to go along with it. Dan Straily did what few Marlins starters have done this year going all the way to the ninth, almost pitching a complete game surrendering just one run on four hits. He’s now improved to 7-4 sporting a cool 3.31 ERA. J.T Realmuto also made an impact this series shooting his own long ball, the backstop’s eighth this season, in the first game. He went 3-for-4 in the opener followed by a 2-for-4 encore in game 2 hitting his fifteenth double of the season snagging two RBIs by series end. Christian Yelich may not have popped any balls over the fence but he laced 3 doubles including the very first in Game 2 of the series that propelled the Marlins into an early lead. With 6 hits to his name, half of them doubles impressively enough, Yelich notched in 3 runs and 2 RBIs. Just hours before the Home Run Derby I looked at the bracket and decided to put in some picks having Stanton, Miguel Sano, Aaron Judge and Cody Bellinger advancing. In the end I was heavily pulling for Stanton to repeat, successfully defending his crown and defeating Judge in the finals. Unfortunately, Stanton was eliminated by Gary Sanchez in the opening round. You could almost tell there was a sense of sadness emanating from the home crowd. I took comfort knowing we still had our secret weapon: Justin Bour. And man was he a beast! He delivered on 22 tremendous homeruns putting some serious pressure on Judge. I was convinced Bour had just eliminated the guy most likely now to win the Homerun Derby. I was already picturing Bour hoisting the trophy with a gigantic smile on his face, a virtual dark horse. An unlikely hero. The man who struck down the Judge. Alas, the euphoria and excitement on paying back the Yankees for Sanchez eliminating the defending champ and our hometown favorite came to an end. Despite Bour’s epic effort, it would come up painfully short with Judge squeaking by with 23 dingers. Both Marlins were out. Damn those Yankees. I knew then and there Judge would have zero problem sweeping away the rest of the competition. Maybe if Stanton made it to the finals or had Judge faced Bour in round 2 things might have been different but Aaron’s power is beyond doubt and without question some of the best, if not the best, the league has to offer. After the second round, the only correct selection I made was Judge getting past Cody Bellinger. And I thought my March Madness brackets sucked. 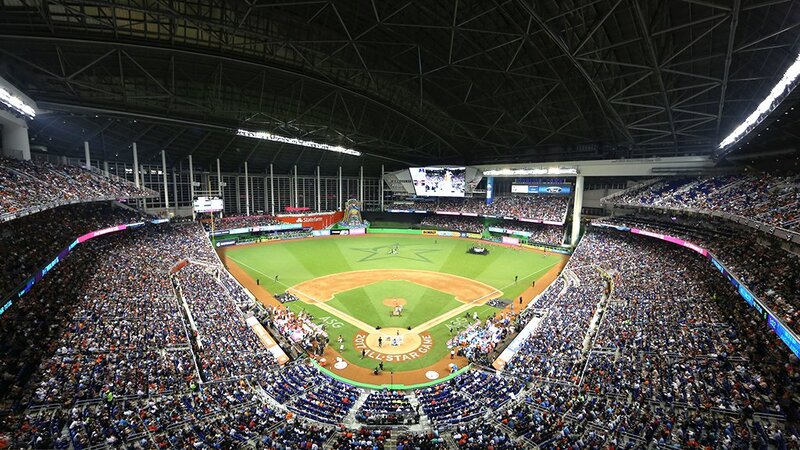 Despite the crushing defeats of Stanton and Bour, the Homerun Derby had its high levels of adrenaline and I have no doubt everyone there left the stadium satisfied with the evening’s main event. When everything was said and done, a grand total of 197 home runs were hit during this years competition. That’s a lot of fans clutching memorable souvenirs. Now all that remains is the All-Star Game, which I will have the honor and the pleasure of attending…up on the third level where no one ever sits. All-Star Stat of the Week: 25. Some players are content just making it to the All-Star Game once, others go repeatedly but the man with the most All-Star appearances is none other than Hank Aaron. He played from 1954-1976. Granted some seasons had two All-Star Games but it’s still quite the magnificent feat. The closest contemporaries are Derek Jeter and Alex Rodriguez with 14 each.